This site was built to inform you of the latest happenings with me both professionally and personally. Here you can find links to various things going on in my life including projects I'm working on, public appearances I'll be making as well as the latest from my personal blog. Please stay in touch by contacting me. Remember when companies used their cash and stock to buy other companies? You may have forgotten because a lot of so called, great companies, are still making the same mistakes of buying their own stock. Instead, here are two companies being smart with their cash and stock. Are you wondering whether to simply purchase Bitcoin, Ethereum, Litecoin and the many mineable crypto currencies or get involved in a mining operation? From old school CPU and GPU mining to companies that built mining specific machines, the choice of options can be overwhelming. ForkDelta is a great place to find up and coming cryptocurrencies before they are well known within the cryptocurrency community. It’s like the minor leagues - the first place ERC20 tokens go to trade before they get picked up by the bigger (and centralized) exchanges. Crypto assets are at the inflection point where the Internet was in the mid to late 1990’s. It's important to understand the potential of blockchain technology and its benefit to the future economy. The Case for Bitcoin $10,000...err...$1+ Million! Every time the price of Bitcoin rises fast, the media is all over it. Once again, it's time for me to speculate about the price per bitcoin come 2040. 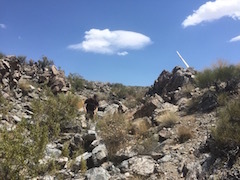 Interested in mineral rich rock samples from real Nevada mining claims? Check out my unique gold and silver ore samples from the historical mining areas between Nelson and Searchlight Nevada! If there's a wine lover in your life, give them the perfect gift! Check out the original wine glass art created by my wife that's now for sale on her website. The idea goes that as interest rates drop, people are expected to borrow more money then spend more, ultimately stoking growth and increasing inflation. The reality is that low rates are having the opposite effect. DIY Websites, Goodbye Twitter and Hello Houston! A brief summary of the updates from the last couple of months.